During the First world war a shortage of steel developed as replacements were being built for the huge tonnage sunk by submarines. Steel was prioritised for construction of warships. Late in the war the USA envisaged a fleet of concrete ships but few were completed before the war ended. The J&R Thompson shipyard at Warrenpoint commenced concrete shipbuilding in 1917. The building firm McLoughlin and Harvey of Belfast were also involved. Construction involved several new techniques in concrete chemistry and strength giving characteristics. The Ulster Museum has a photo of the Creteforce under construction in 1919. Some of the ships were ocean going tugs. Two such ships survive in Irish waters. The Creteboon was intended in the 1930s to be sunk as a blockship to prevent sand from flowing from Bartra island into the Moy channel. Instead she is beached in the Moy just downstream from Ballina. 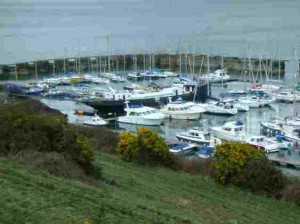 The Cretefield has been included in the Carlingford yacht marina just opposite where she was constructed. ‹ Morven Disaster. December, 1906.